Today is Tuesday, December 20, the 355th day of 2016, with 11 days remaining. There is one day until the winter solstice, three days until Festivus, four days until the start of Hanukkah, five days until Christmas Day, 31 days until Donald Trump becomes president of the United States, and 686 days until the November, 2018 mid-term election. 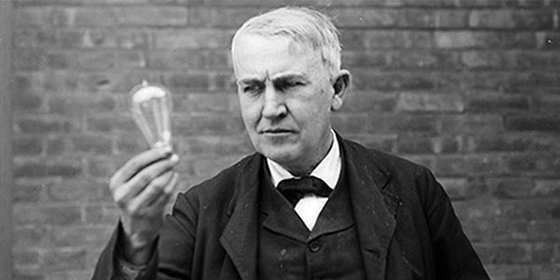 On this day in 1879, Thomas Edison privately demonstrated his incandescent light at Menlo Park, N.J. Historians list 22 inventors of incandescent lamps prior to Joseph Swan and Thomas Edison. They conclude that Edison's version was able to outstrip the others because of a combination of three factors: an effective incandescent material, a higher vacuum than others were able to achieve, and a high resistance that made power distribution from a centralized source economically viable. Among other things, today is also Cathode Ray Tube Day. Since the late 2000s, CRTs have largely been superseded by newer display technologies such as LCD, plasma display, and OLED screens, which have lower manufacturing costs and power consumption, and significantly less weight and bulk. Newer display technologies can also be made in larger sizes; whereas 38" to 40" was about the largest size of a CRT TV, new display technologies are available in 50" to 60" and even larger sizes. Florida man tries to take selfie with gun, shoots bathroom. While at Club Lust in St. Petersburg, Rorn Sorn, 34, started to pose for his picture when, according to police, somehow the gun went off, sending a bullet into the women’s bathroom next door. As of this writing, The KGB Quotations Database contains 43,333 entries. Check it out. Branch Rickey (1881-1965), innovative Major League Baseball executive. "Don't despair: despair suggests you are in total control and know what is coming. You don't- surrender to events with hope." It's probably nothing to worry about, but this is 2016... Hong Kong has confirmed its first case of bird flu. The 75-year-old male infectee had visited the southern Chinese town of Changping in Dongguan city this month before returning to Hong Kong, apparently bringing with him the deadly H7N9 virus. Discovery of watermelon snow in the arctic is not good news. A form of algae, its pink color reduces the reflectivity, or albedo, of snow and ice, causing it to melt faster. This bio-albedo feedback is accelerating the disintegration of ice cover around the world. Pregnancy leads to long-lasting changes in human brain structure, according to a new study, with effects lasting for two years. Fortunately, I'm guessing the brain kicks in again around that time for self-preservation purposes. Managing a two-year-old requires all the gray matter to be firing on all cylinders. Signs of the apocalypse, #912: Pope Francis declared at the Pontifical Academy of Sciences that the theory of evolution and the Big Bang are real, and God is not "a magician with a wand." "When we read about Creation in Genesis, we run the risk of imagining God was a magician, with a magic wand able to do everything. But that is not so. The big bang, which today we hold to be the origin of the world, does not contradict the intervention of the divine creator but, rather, requires it. Evolution in nature is not inconsistent with the notion of creation, because evolution requires the creation of beings that evolve." In addition to Yahoo's massive 1 billion account security breach, other companies that have been hacked recently include Quest Diagnostics, LinkedIn's lynda.com, and KFC. Your chicken addiction is now public knowledge. New research estimates that if all physicians were female, 32,000 fewer Americans would die every year, among Medicare patients alone. The research is published in the journal JAMA Internal Medicine. Researchers from Harvard University reviewed the records of 1,583,028 hospital visits among Medicare patients. Within 30 days of arriving at the hospital, rates of death and re-admission were significantly lower when the patient’s doctor was female. Today is my monthly "Old Man Breakfast" with my good friend David Anderson, in which we hit the Eat 'N Park Tuesday Senior Breakfast Buffet, discuss and resolve the world's problems. Today we may be staying through dinner.